The Harrisonburg office of the Shenandoah Valley SBDC is located in the JMU Ice House at 127 W. Bruce Street, 2nd floor. From I-81 N, take Harrisonburg Exit 245 (JMU exit). At top of exit ramp, turn left onto Port Republic Road. Continue straight onto Maryland Avenue after approximately 0.2 miles. At the High Street (Rt. 42) intersection, turn right. Go approximately 0.7 miles, past the JMU Baseball fields, and turn right onto Bruce Street. 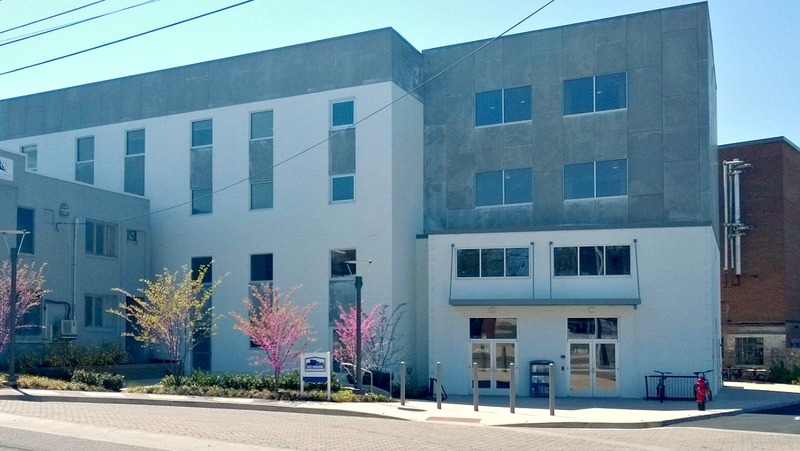 The SBDC is in The JMU Ice House, 127 W Bruce Street, the white building on your right after crossing the railroad tracks. From I-81 S, take Harrisonburg exit 247 B (33 W) and merge onto East Market Street. Follow into downtown Harrisonburg and proceed around Court Square and out the other side onto West Market Street. Turn Left on Liberty Street; go two blocks to Bruce Street. Turn Right on Bruce Street. Our building is the JMU Ice House, 127 W Bruce Street, a large white building on your left. SV SBDC, From Rt 33 West of the City Turn right onto High Street (Rt. 42)Take second left onto West Bruce StreetThe SBDC is in The JMU Ice House, #127, the white building on your right after crossing the railroad tracks. Parking Options: 1) Clients and visitors may park on Bruce Street if spots are available; 2) the JMU lot across the street has 6 marked Visitor Spots which are open to our clients and vistors; 3) the upper part of that lot (near Water Street) has spots indicated "Ice House Visitor" where clients may park (please be advised that other spots are permit only), or 4) clients and visitors may also park in the Water Street Parking Deck located 1 block away. Click on the map of downtown Harrisonburg for a larger view. The JMU Ice House is circled in red. 18 Government Center Lane, Verona, Virginia 24482. From the North: From Interstate 81, take Exit 227, Verona. Merge onto Laurel Hill Road (Route 612). At the second traffic light, turn left onto Lee Highway (Route 11). At the next traffic light, turn left into the Government Center complex. Enter the main doors (pictured above), go down the stairs and turn right. Follow the signs for the Small Business Development Center (make a left down a long hallway, then take the 1st left). From the South: From Interstate 81, take Exit 225, Woodrow Wilson Parkway. Turn left onto Woodrow Wilson Parkway (Route 275). At the first traffic light, turn right onto Lee Highway (Route 11). At the second light, turn right into the Government Center complex. Enter the main doors (pictured above), go down the stairs and turn right. Follow the signs for the Small Business Development Center (make a left down a long hallway, then take the 1st left). 150 S. Main Street, Lexington, Virginia 24450. We meet in the Economic Development Conference Room on the 2nd floor. 18 Campbell Street, Luray, Virginia 22835. We meet in the Chamber's Board Room. See a downloadable/printable map of the University. 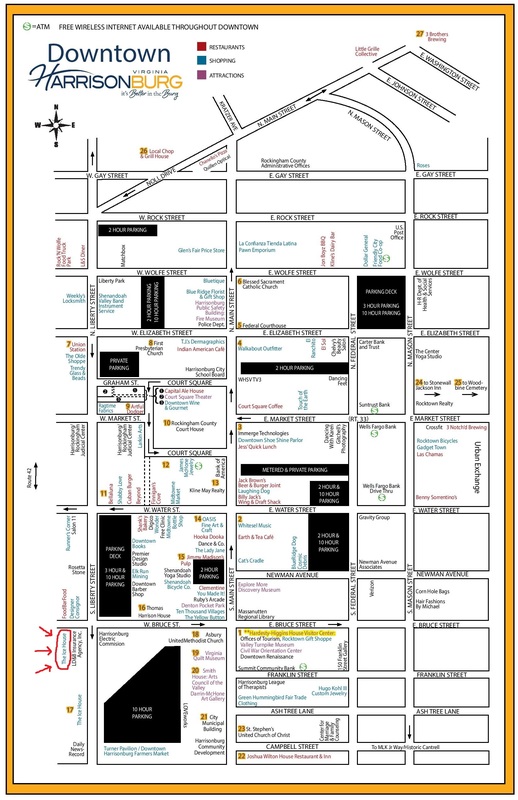 The Festival Center is located in the lower right quadrant of the map. From the north: Turn left onto Port Republic Road, cross the interstate and immediately get into left turning lane. From the south: Turn right onto Port Republic Road and immediately get into left turning lane. Make a left onto Forest Hill Rd. At the stop sign, make a left onto Oak Hill Rd and continue around the curve (turns into University Blvd). The Convocation Center will be on the left followed by the Arboretum on the right. Make a left at the JMU entrance onto Carrier Drive. The Festival Conference Center 0.25 mile on the left. From I-81, Exit 247A to Rt 33E. Immediately cross Rt 33 to the left turning lane so you can turn onto Linda Lane. Go past Lowe's; turn left at the stop light onto Country Club Road. American National University will be ahead on your left. From I-81, Exit 247B to Rt 33W. From Rt 33, turn right at the 2nd stop light onto Carlton Street. Then right onto Country Club Road. Proceed under the interstate bridge and American National University will be ahead on your right. Ending at 1515 Country Club Rd. From Rt 42 (High Street/Virginia Avenue) in Harrisonburg, travel north to Mt. Clinton Pike. Turn left at the shopping center. Pass Gift and Thrift on your left, turn left into the parking lot for Artisans' Hope and A Bowl of Good Cafe. Drive around behind the building to the meeting room entrance.